Wikipedia, the encyclopedia of the Internet, is a constant work in progress. Its articles are being crowd-edited every minute by scores of people around the world. Now, thanks to two programmers, you can see what articles are being edited in real time, with every edit conveniently displayed on a world map. Stephen LaPorte and Mahmoud Hashemi created the map, and it's available on this website ( http://rcmap.hatnote.com/#en). When you visit the site, the map starts live-updating any time an unregistered Wikipedia user makes any change to one of its more than 30 million entries. The creators of the map note that it only displays edits made by non-registered users, which only make for 15% of the total edits on the site. 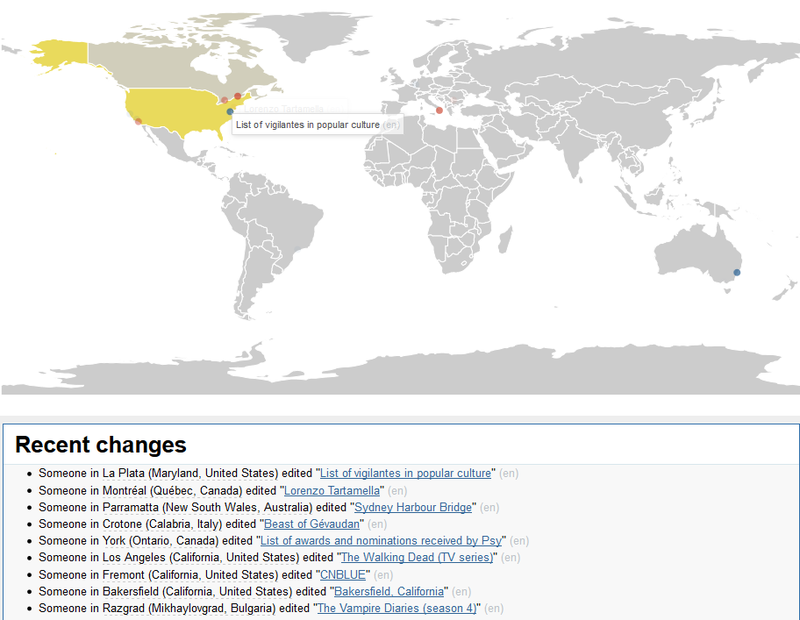 "Edits by registered users do not have associated IP information, so the map actually represents only a small portion of the total edit activity on Wikipedia," wrote the programmers on the site. The map provides a fascinating peek into what people around the globe are interested in and what they tinker with on Wikipedia, as well as the fact that more often than not, people edit entries that have nothing to do with where they're from.